Major Bob Ivany with President Reagan in the White House – 1984. It was the summer of 1984 and I was a lowly major who had been recently transferred from the Pentagon to the White House. 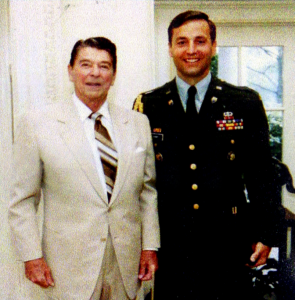 I was being ushered into the Oval Office to meet President Reagan and I was just a bit nervous. I had been carefully prepared for my assignment as his Army aide for a, hopefully, two-year stint. Now was the big moment to meet him. President Reagan in the Oval Office lobbing a football. I was surprised at his question but, of course, answered that I had played for Army. “Well,” he said, “what position did you play?” I aanswered that I played offensive tackle. “Marvelous,” he replied, “I played offensive guard at Dixon College. Now what side of the line did you play on?” I played on the right side, I answered. “Wonderful,” he said “I played on the right side as well. The right side is always stronger!” Our short exchange only lasted a minute or two, but I never forgot his kind effort to put me at east, to show his personal interest, and give me a memory for a lifetime. 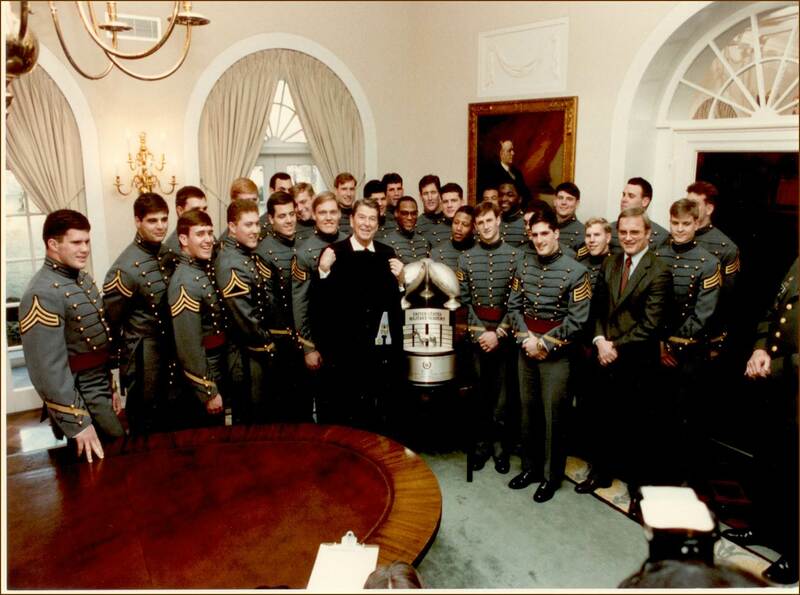 Members of the United States Military Academy football team in the Oval Office with President Reagan and the Commander-in- Chief Trophy after winning the 1986 Army-Navy game.